UPDATED: Thu., Aug. 23, 2018, 4:29 p.m.
Spokane may soon get a reprieve from the lingering haze of wildfire smoke, but it’s likely to be short-lived. The National Weather Service predicts much of Thursday will be dominated by eastward wind, which will push much of the blanket of smog out of the region. It also means any smoke hovering west of the Cascade Mountains and in central Washington will force its way to the Inland Northwest, making the air worse before clearing out. By Thursday evening, VanHorn said Spokane should see a fairly significant upgrade from the weekslong trend of awful air. But as winds from the west subside, he said there’s a good chance smoke will continue to drift down from British Columbia, putting air quality back into unhealthy categories. “We’ll have to see how things are looking tomorrow morning,” he said. 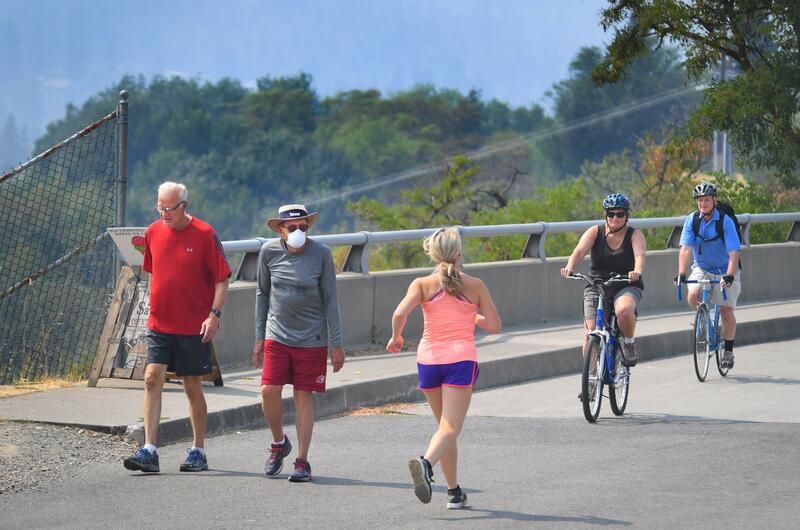 Since Aug. 8, according to data from the Spokane Clear Air Agency, the region has experienced 11 days of air in at least the “Unhealthy for Some Groups” category. The city had its worst day of air quality on Sunday, when wildfire smoke pushed the air quality index into the “Hazardous” category, where it sat for more much of Monday before clearing out in the afternoon. Eagle-eyed air quality viewers may have noticed Thursday morning that the state’s Department of Ecology-run air monitoring service was down for about five to six hours before coming back online at about 6 a.m.
Andrew Wineke, Communications Manager for the department’s Air Quality Program, said an error occurred during an overnight scheduled restart, which caused the system to crash. The statewide monitors, including two in Spokane, were still collecting data. Published: Aug. 23, 2018, 12:32 p.m. Updated: Aug. 23, 2018, 4:29 p.m.